It's official—2019 may go down in history as the year the slip skirt became bigger than it was in the '90s. However, it's worth noting that this resurgence didn't take hold until the start of the summer. From that point, there was no stopping the outfit concoctions that could be based around such a relatively humble sliver of bias-cut satin—two of which made the cut when it came to the Who What Wear UK team really distilling down the "most 2018" outfits of this past year. Along with the new jeans-and-jacket pairing that hit the big time, the dress style fashion girls adopted once more (this time with a major shoe twist) and the colour palette that couldn't be questioned in its omnipresent, all-encompassing potency, were slip skirts. There are multiple looks that our circle of influencers couldn't resist—so much so that it can be difficult to know where an outfit started and whether we've reached its peak when its shifted and been reformed so many times. There are ensembles that sent Pinterest into a repinning spin and one particular street style moment that sent photographers into a frenzy to capture such a defining look of summer 2018. It's highly likely you've tried many of the below combinations, and there's good news: They are all entirely relevant for the year ahead. Like all ongoing trends, tweaks will occur over the months, but the basis of some quality outfitting lies here. Keep reading to see the look that defined 2018, and let us know which you love or have worn by tagging #wentoutlikethis on Instagram. Perhaps the first defining look of 2018 and the start of the slip-skirt trend began with this leopard piece from Réalisation. Most girls wore theirs with simple T-shirts, a denim jacket and flat shoes or sneakers. The formula developed slightly for A/W 18, moving into all kinds of slip skirts (printed or block colours) being worn with slouchy knitwear. Monikh became the queen of slip skirts and will surely lead the idea into new territory for 2019. If you didn't feel tempted to try out a boilersuit for size, what happened? We couldn't help but adopt this trend with open arms such is the flattering and versatile nature of the casual all-in-one. To make the idea unique many women we admire took to layering theirs with a little slim-fit roll-neck underneath—perfection for months to come. In 2018, party dressing came back with a big, 1980s-shaped bang. That meant after-dark dressing really was all about hitting it hard or going home, so ultra-short, gigantically sleeved minidresses suddenly boomed out of nowhere, leaving more sombre, laid-back midis eating their dust. This particularly spectacular look from Anna Vitiello in Isa Arfen was one of the team's favourite street style pics of the year. Not strictly an outfit, we know, but definitely a moment in 2018 time. Suddenly every influencer under the sun started taking towel-head shots complete with glam jewellery and/or a full face of makeup. Wrap dresses starting gaining popularity in 2017, but it was this summer that really saw new iterations fly into view. Ganni's red leopard-print version was particularly popular, being worn in almost this exact, laid-back format by multiple women we know. Perhaps the most "viral" of all 2018 looks, stylist Julie Pelipas caused a regramming storm when she stepped out wearing this relaxed trouser-and-tank combination to Haute Couture Fashion Week in Paris in July. It spawned many a copycat look, and headlined the ultra-beige summer our wardrobes and Instagram feeds experienced. Topshop's pinafore dress was the gift that kept on giving. It first launched way back in March, rendered in a jumbo white-and-black polka-dot fabric. This debut version promptly sold out, was restocked countless times and then arrived in more and more new prints and colourways. 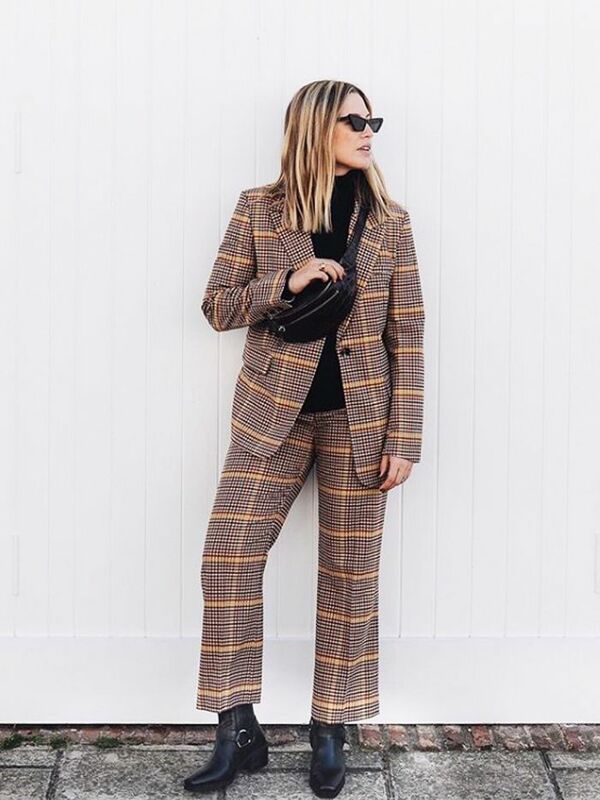 The way it was most commonly styled was with a flattering top underneath (often a black roll-neck) and is still seeing plenty of mileage in the closets of the influencers we closely follow. A relative newcomer to 2018's It outfits, we've noticed that French girls have a new casual formula they're relying on: slim jeans, a neat cardigan and smart mid-heel pumps. As cardigans have been staging a comeback throughout the year, you might find this one of the chicest and easiest ways to get in on the trend. Could this pink Mango suit have been any more photographed during the fashion month marathon in September and October? You were very lucky if you managed to get hold of it. Fashion editors and buyers were willing to put down their designer purchases and opt for the high street in a heartbeat. It confirmed that corduroy keeps on growing stronger each autumn/winter season, and Millennial Pink isn't going anywhere, folks. We told you a long time ago that cowboy boots were returning, but this year has seen fashion girls embrace their Western roots fully, pairing them with equally rustic prairie dresses. Throw in a few mega-cute accessories (like a beaded pouch bag) and we reckon this concoction will carry on well into summer 2019. This trouser shape re-entered the stratosphere thanks to the '80s trend that continues to have a hold over fashion circles. 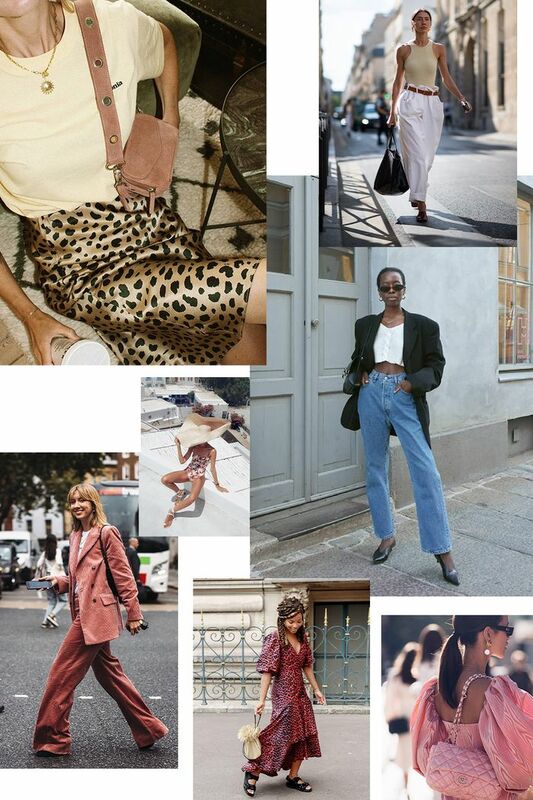 Many girls wore the throwback formula of paperbag trousers with an equally retro piece of knitwear, modernising the look with simple, strappy heels (a sandal trend that we know is only going to get bigger in 2019). When stylish women weren't pairing cowboy boots with prairie frocks, it was highly likely they were reigniting our passion for flattering tea dresses, only making them 4000 times cooler by adding some sneaks into the mix. This posh-casual ratio is still full of life and going strong all over social media and our own wardrobes, complete with the oh-so-2018 shell jewellery you can see here. You can run, but you can't hide: Cycling shorts are coming for you. Reframing these jersey cutoffs for a more discerning crowd (read: those who aren't Kim Kardashian West and willing to wear them outside with a bra top), Pernille really led the way for how to make the workout item look work-appropriate by adding heels and a blazer. She even talked some of the most ardent athleisure-allergic into it. Expect this to continue with wild abandon in 2019. As per our deduction of the year's style tribes, a set of girls emerged for whom dressing up was vital to their existence. This mean the frothiest of dresses, the most delicate of shoes and the sweetest of cutesy accessories were all worn together, much to the enjoyment of us all on the other side of the feed. In a year that felt tumultuous at best, this offered up some fairy-light relief (and a chance for us to buy more pink things). In the same vein as party dressing stepping up an elaborate notch, beachwear really came into its own in 2018. No longer was it acceptable to solely wear a bikini or swimsuit on your holiday—you needed a separate suitcase for mega accessories and perhaps a manservant to carry your gigantic Jacquemus sunhat. It was near impossible to find the brand's La Bomba sunhat in stock, but you would have certainly seen it all over Instagram, shading the faces of those on snazzy holidays all over the world. Girls started wearing blazers with jeans again back in 2017 after a long stint for this formula in fashion Siberia. Naturally, 2018 saw the easy-peasy twosome move on with skinnies being swapped for straight-leg jeans and super-boxy blazers replacing anything too formal and fitted. Somehow, this look combined both the '90s and '80s, yet it's very, very likely to still look hot for the next few seasons. Next up, the 2019 wish lists of our favourite influencers.